On Wednesday, May 15th I was let out of school early for the long weekend (thank you Buddha!). 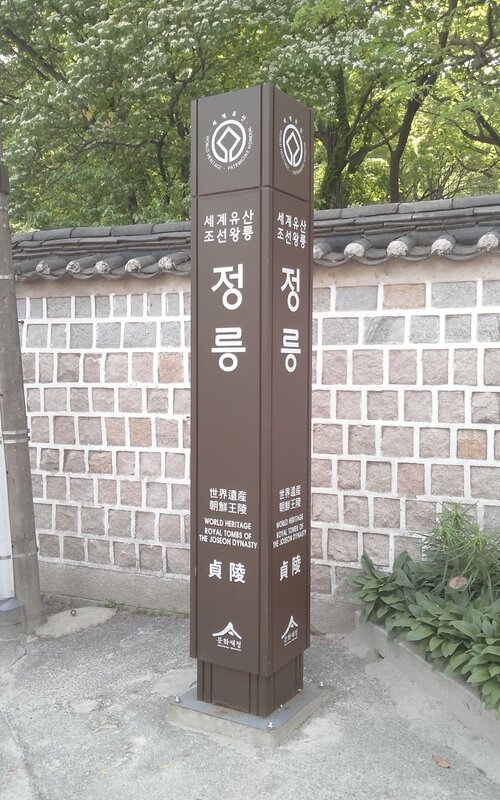 As most of my friends needed to work, I ventured out alone to Jeongneung (정릉) which is a tomb close to my workplace. Along with other Joseon dynasty tombs, it is a UNECO world heritage site. Score. After following a bunch of signs up and down hills, I finally found the entrance to Jeongneung. 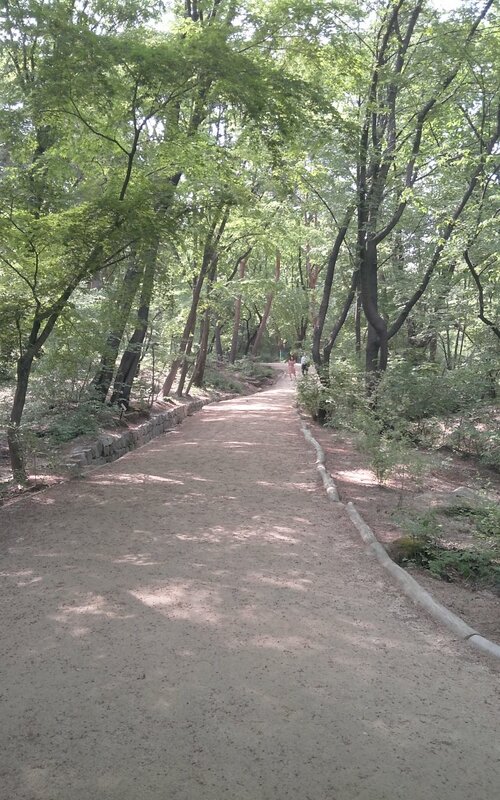 I paid a small entrance fee (1,000 won), grabbed a map, and walked around. As it was a Wednesday afternoon, there were few people in the park: mostly ajjumas and ajjeoshis. A quick walk brought me to the tomb. Well, within sight of the tomb. As you can see, the tomb is at top of the hill. I saw no way to get up to the tomb, so I imagine it isn't possible to get a close look. 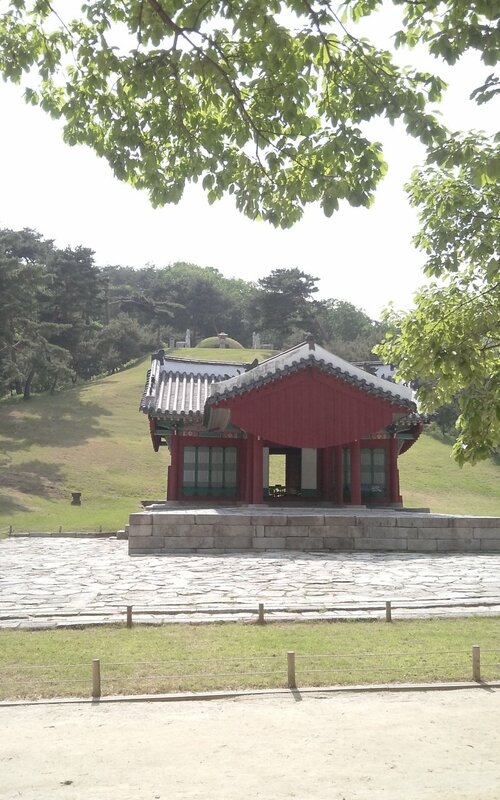 The tomb houses Queen Consort Sindeok, who was the second wife of King Taejo (the founder of the Joseon dynasty). Her place in history is a bit interesting, so to learn more, check out the Korean Cultural Heritage website for details. I imagine the surrounding vicinity rather than the tomb itself gives reason for the locals to visit. Smack dab in a very apartment-heavy neighborhood is a very green and walkable area. One walking course goes around Jeongneung's land, and takes about thirty minutes. If it was a little closer to my school, I would visit often to go for jogs. Peaceful, if a bit hilly, Jeongneung can be seen in about an hour. In front of exit 6 of Sungshin Women's University station (Donam station / Seoul Subway Line 4), take city bus No. 1012, 1014, or 1212 and get off at Arirang Market. Walk 5-10 min.